Party leader Lucinda Creighton faces a battle to hold her seat in Dublin Bay South. 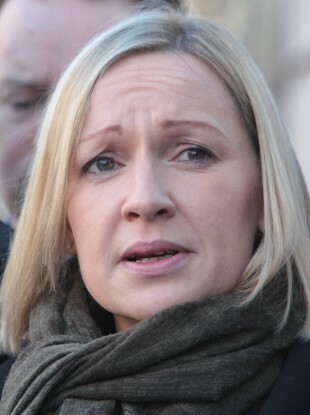 Lucinda Creighton had hoped her party would win 10 seats. RENUA MAY NOT return any Dáil deputies with leader Lucinda Creighton at serious risk of losing her seat in Dublin, according to party sources. Renua sources are privately admitting this afternoon that it’s going to be a bad day with the possibility that the party, which was founded less than a year ago, will not have a single TD in the 32nd Dáil. They believe that while Creighton will remain in contention for the fourth seat in Dublin Bay South until the last count, she may not gain enough transfers. That could see Fine Gael on course to take back the seat it lost when she quit the party three years ago. Creighton was booed by a small number of people upon her arrival at the RDS this afternoon. The former minister said she had “no idea” if she would hold her seat. I have said from the very beginning that this was going to be a huge struggle in this constituency, a real battle and it has proven to be so and it’s extraordinary to see so many candidates in contention for seats in Dublin Bay South. “Fingers crossed I will hold my seat, but if I don’t I am very philosophical about these things and at the end of the day the voters decide,” she added. She said the party’s work would continue irrespective of what happens, describing this election as “the first step”. It’s a benchmark, it’s the first of many electoral contests I hope. Well, obviously on the figures it’s not going well for Renua but I really enjoyed the campaign. Of the other two outgoing Renua TDs, deputy leader Billy Timmins will have a chance of holding on in five-seat Wicklow. In Dublin Bay North, Terence Flanagan is unlikely to be returned in the competitive five seater. The party had hoped to win 10 seats and ran 26 candidates in the 40 Dáil constituencies. One of its big hopefuls is councillor John Leahy in Offaly but he is unlikely to win a seat. Bradford told RTÉ: “Across the country, our candidates – who have all worked very hard – they are not getting the percentage you need to be in contention for the last or second last seat. My colleague Billy Timmins is in contention for a seat and Lucinda – the party leader and my wife – is in contention but with a battle on her hands. He said the party had taken “the road less travelled, we put a very detailed manifesto before the electorate but it hasn’t been purchased”. We’ll end up where the Greens were five years ago and they look set today to take a few seats. Politics is for the long haul, it’s not a short-term project. If you believe in something… you must plough ahead. You have to climb mountains. Email “It looks like Renua might not win any Dáil seats”. Feedback on “It looks like Renua might not win any Dáil seats”.